“After the show we got very, very excited. I ended up getting a matching tattoo with Kelsea Ballerini. It’s currently on my hand. It’s actually her song, square peg in round hole. Her makeup artist Meegan Pearson and some other members of her crew were also part of the matching tattoos. 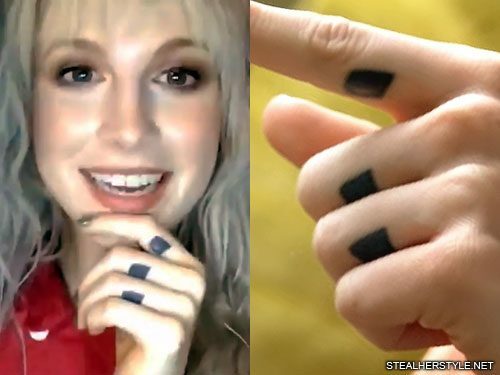 Hayley Williams announced her divorce from longtime partner Chad Gilbert in July 2017, leaving her with a regrettable tattoo of his initials “CEG” across three of her fingers. She covered them up with three black squares in February 2018. 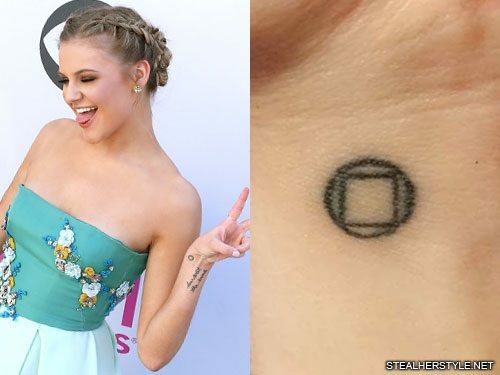 The boxes mean that she no longer has to see his initials, but going for such a dark cover-up makes it much more difficult if she ever wants to have laser removal. 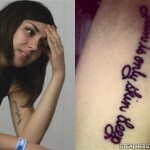 This tattoo is something that Hayley doesn’t want to talk about for obvious reasons. When asked about her latest tattoo in an interview, she joked “how deep do we want to go?” and then proceeded to talk about her second most recent. Writing kept me alive. Forced me to be honest….It helped me realize that I shouldn’t have ever married my ex and that love is not something we can just extract from one other. 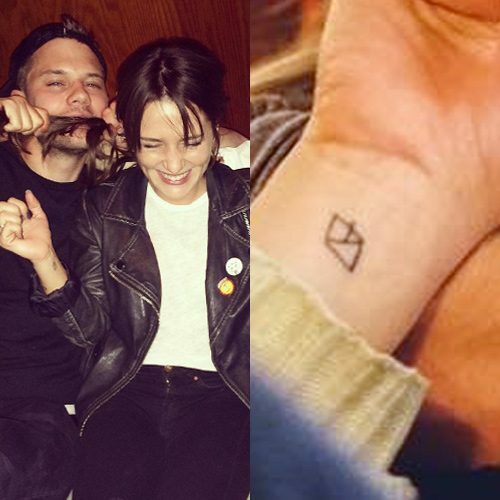 Addison Timlin has a small square tattoo on her right wrist. Jessica Szohr has a tiny square design on the left side of her body. Emily Bett Rickards has a tiny outlined square ink on her right wrist. 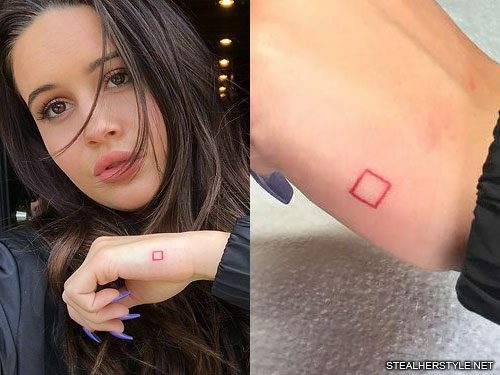 Bea Miller got this red square tattoo on her hand as a matching tattoo with three members of her crew: makeup artist and hairstylist April Bautista, social media manager Becky Sake, and digital marketer Kelley Fox. The four sides of the square represent the four of them. “my team > urs” wrote Bea on instagram. actress Marsha Thomason has a tattoo of four black squares connected by a line on her right upper arm. During a panel at Comic Con she revealed that she came up with the design herself and there is no deeper meaning behind it.